Hey there, I’m back. I had a lovely time but now it is time to get back to work. I have lots of things to do ahead of me so I thought I would first indulge in some felt flower making. The weather in Dublin is not as summery as one would wish. 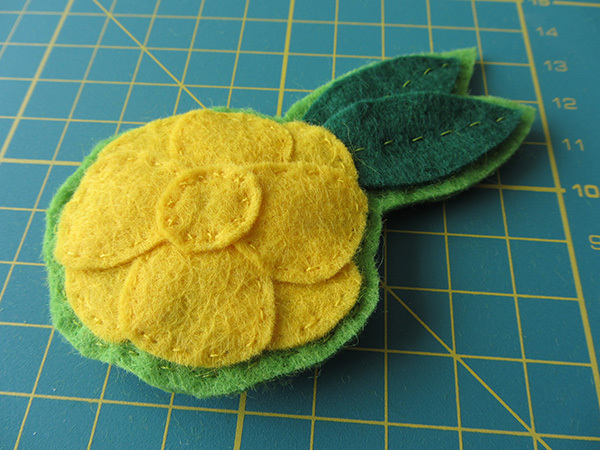 That’s why I felt like making a flowery felt brooch. The design is inspired by the few ones that manage to grow and blossom in my front garden. It is around 9×5 cm (4×2”) large. This would make a great gift for someone who loves gardening. Or for someone like me who is not able to grow anything but still likes flowers. This is an easy project and it can be completed within 1 or 2 hours. I give you all the steps and the template to do so below. 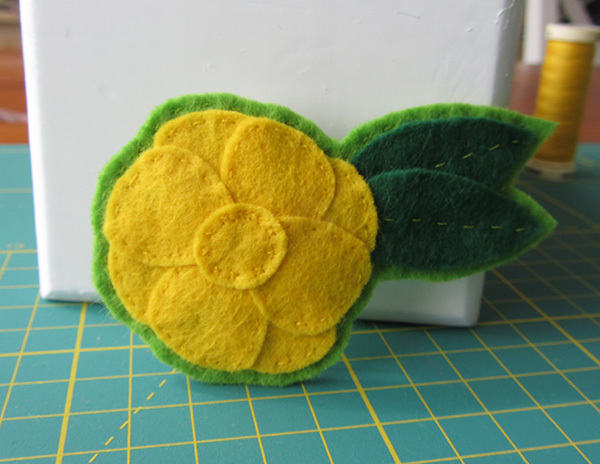 Yellow felt – only a small piece to cut out 8 petals and one centre. 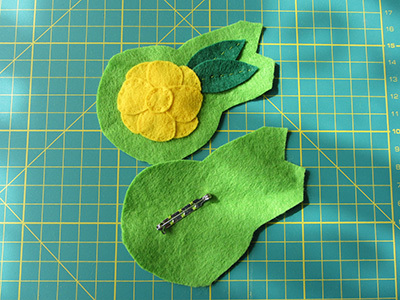 Light green felt – very small piece to cut out two leaves. Dark green felt – a 7×20 cm piece (3×8”). 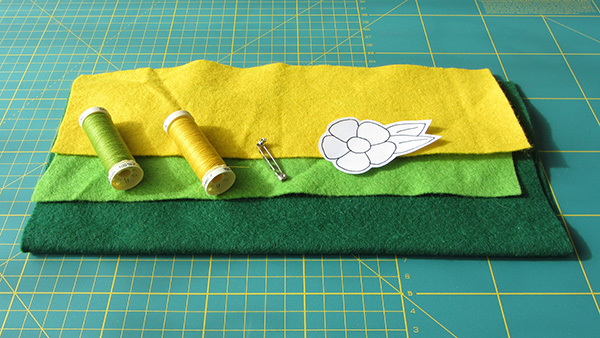 Yellow and light green thread to match the felt colours. Flower template provided for free here. 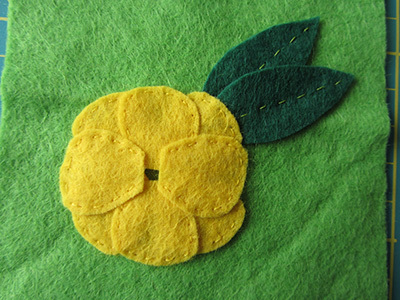 1 – Using the template: cut out eight petals and one circle from the yellow felt, two leaves from the dark green felt. 2 – Cut two rectangles of light green felt of 7x10cm (3×4”). 3 – Pin the leaves towards the top right corner of one of the light green rectangles. 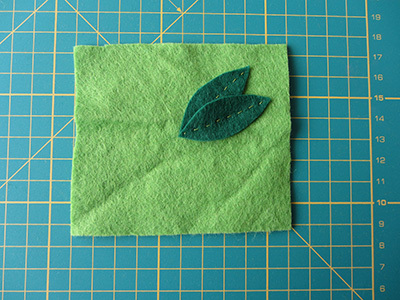 Using the light green thread, make a running stitch on the central line of each of the leaves. The result of this step is shown on picture 3. 4 – Lay 4 petals as shown on picture 5. Hold them into place by holding them between your thumb and forefinger and secure them with a couple of loose stitches. 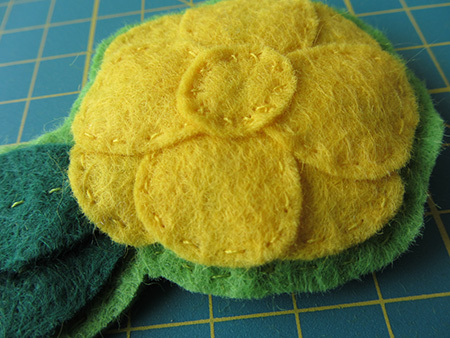 5 – Make a running stitch around each petal using the yellow thread. Remove the loose stitches. Result of this step is shown on picture 5 above. 6 – Lay the 4 remaining petals so they hide space between petals of the first layer. Stitch the petals as explained in steps 4 and 5. You should now have something like shown on picture 6. 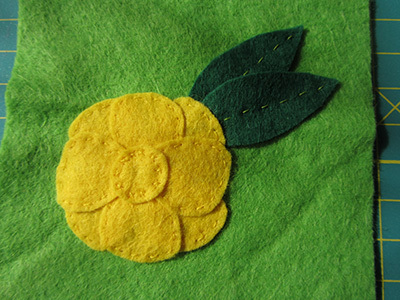 7 – Put the centre of the flower into place and secure with a couple of loose stitches. Make small cross stitches all around the flower centre close to the edge as shown on picture 7. 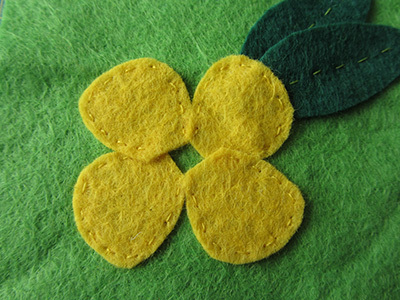 8 – Hold both light green felt pieces together and roughly trim around the flower shape (leave 1cm – 1/2” of green felt around the flower. 9 – Stitch the brooch pin on the background felt piece. It should sit somewhere in the middle of the petals. You now have two light green pieces ready to be assembled as shown on picture 9. 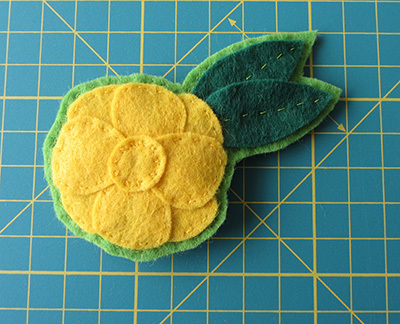 10 – Pin the two light green felt pieces together so both flower and brooch pin are on the outer side. 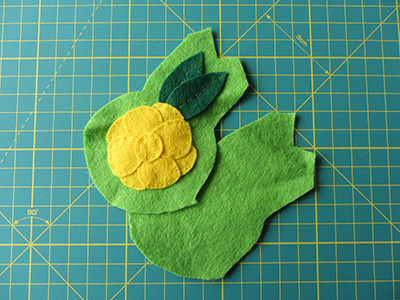 Using the light green thread, make a running stitch all around the flower and leaves. Trim extra light green felt approximately 2mm (1/8”) from the seam. You’re done! You now have a flower brooch as shown on picture 10. I really loved making this brooch and may make more flower projects in the future. What about you, do you enjoy flowers? Do you manage to get real ones growing in your garden or are you a felt gardener as I am? This is a great tutorial. I love flowers but only grow the ones that need little attendance! I look forward to seeing more of your lovely creations. Thanks, I already have some more ideas of what I could make with felt and flower designs. Good – look forward to them!